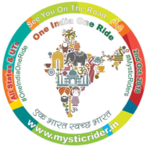 Roads are integral part of human connectivity, team The Mystic Riders started their One India One Ride on 2nd October 2018 from New Delhi with a mission to spread social messages. The objective of the team was to transform passion of riding in bringing positive social changes. Rider Ansh, who also a member of Flying Squad India Mumbai leading the ride along with two other riding member of The Mystic Riders Sahil Vaid & Mandeep. Many riders and riding groups joined hands with the team to facilitate the ride smoothly. This article will bring few highlights of the phase 1 (Edition I) ride so far which ended at Barmer as last destination in Rajasthan on 8th Oct 2018. The full ride details day wise, event wise will be published separately as separate article. On 2nd October 2018, the ride was flagged off by Rajkumar Bhatia at New Delhi from Sanatan dharm Temple Indra Nagar New Delhi. Residents of Indra Nagar blessed all three riders before they start their ride, which continued up to Gurgaon to receive a natural shower of blessings from the sky in form of rain. Riders enjoyed the initial rain drop as holy water before reaching Jaipur as their 1st Destination to cover around 280KM of ride on day 1. 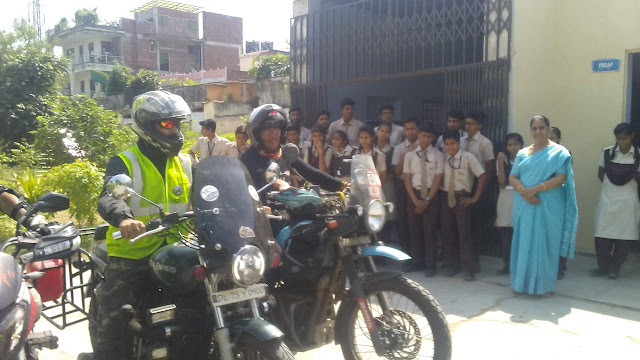 By the time riders reached Jaipur meet with Rider Nikhil Bhai who interacted with OneIndiaOneRide riders with his valuable wishes and support, Rider Sohail Khan Admin of a Jaipur Riding Club Over Charged Engines, who welcomed all riders formally and accompanied them up to Nanu’s Hostel. The very next day riders visited the Pink City Jaipur to interact with local riders and public, Bhaskar Bhai who a passionate rider and Medical Representative by profession Interacted early in the morning with his friends, wishes riders all the best for future ride and guided to the Bike Market Near Ajmeri Gate Jaipur to have some minor check up of bikes. 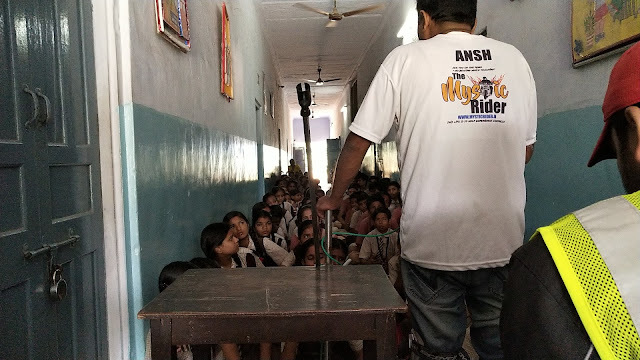 It was a great opportunity for OneIndiaOneRide riders to interact with Sunita, along with her inspirational word riders moved to S.S. Jain Subodh College to meet principal for a small interaction. Evening was eventful with Rider Sohal Bhai, visited the Thali House C-Scheme to have famous Rajasthani Dal Bati Churma. Riders enjoyed a small night ride in pink city visited Hawa Mahal and few other places in the city. A Satisfactory Student Interaction at Shree Kanya Sadachar Pathshala, where riders welcomed by HM Usha Mam and interacted with around 150+ students, discussed on various career planning methods along the importance of Goal Base career Planning. Which was also Joined by Rider Vaishali Bhagat & Manish Saini. After the session completed riders demonstrated the riding technique and its safety mechanism with students along with teachers. Started early in the morning towards Jodhpur after visiting Ajmer, where taken blessings from senior citizens along with a successful interaction on topics “Send Kids to Schools”, riders moved towards Pali to visit Om Banna temple at Pali before proceeding towards Jodhpur. The atmosphere was excellent with lots of positive energy at Om Banna temple, where all three brave riders experienced some soothing Rajasthani folk songs. Afternoon they started their ride again towards Jodhpur, late in the evening checked in to Nature Trail Camp at heart of Jodhpur. An action packed day with visit to Mehrangarh Fort, and evening rider meetup, where exchanged idea and experience with riders from different riding club of Jodhpur like 19BHP, Jodhpurking etc. OneIndiaOneride’s rider Ansh extended special thanks to Rider Vipul Kulshrestha of 19BHP along with Rider Kamal, Sailesh Ji and Santu Bhai. Late evening riders had an Interaction with Surinder Singh Bika Bhai who specially helped in coordinating few school visit in Barmer region for next day. Early In the morning riders moved to Village Bartola to address school students and helping them in their study at Vivekanand Model Public School, though it was Sunday a holiday, HM Padam Singh ji helped in arranging a student interaction at hostel, where rider Ansh deliver a session on how to plan future study based on interest and goals, it was an exciting interactive session, which was followed by lunch at hostel along with students. Meanwhile Rider Jitu Bhai from Barmer Joined the relay ride up to Padri from Bartola, where a session on responsible parent was already scheduled by Mr Ranchor sir. The topic for discussion was how to be a responsible parent which will enhance kid’s mind for goals and future study. Villagers were delighted with the session and appreciated with taking commitment from The Mystic Riders to return and conduct a three days similar session and workshop in their village. Yes, women are already empowered, there is no need of any women empowerment programs, rathe a program can be done for changing men’s thought process about women. After Padri village session, riders visited Rekhaji’s house, who post her marriage, taking care of her paralyzed mother, since last 18 years. Each and everything being taken care of Rekha ji along with her regular housewife duties. The Mystic Riders salutes this living goddess and wish her all the best. Late night riders reached at Barmer, warm welcome at Jitu bhai’s home for dinner which was typical Marwari style excellent presentation. Riders expressed thanks to family members of Jitu bhai for their love and affection. The started with a great heart touching student interaction at barmer before the press meeting, the session was attended by around 200+ students and 10+ teachers along 15+ press personals. The interaction was focused towards Goal Based Career Planning and how to keep motivating self for study. It was highly appreciated by all spectators which also provided a large local and national media coverage. Post session riders were requested by media to give them some video shoot which was done in Barmer desert region before riders moved for their next Destination Ahmedabad.